Is DSW Inc. (DSW) Going to Burn These Hedge Funds? Is DSW Inc. (NYSE:DSW) a good investment right now? We check hedge fund and billionaire investor sentiment before delving into hours of research. Hedge funds spend millions of dollars on Ivy League graduates, expert networks, and get tips from industry insiders. They sometimes fail miserably but historically their consensus stock picks outperformed the market after adjusting for known risk factors. Is DSW Inc. (NYSE:DSW) a great stock to buy now? Money managers are in a bullish mood. The number of long hedge fund positions rose by 4 recently. Our calculations also showed that DSW isn’t among the 30 most popular stocks among hedge funds. DSW was in 27 hedge funds’ portfolios at the end of the third quarter of 2018. 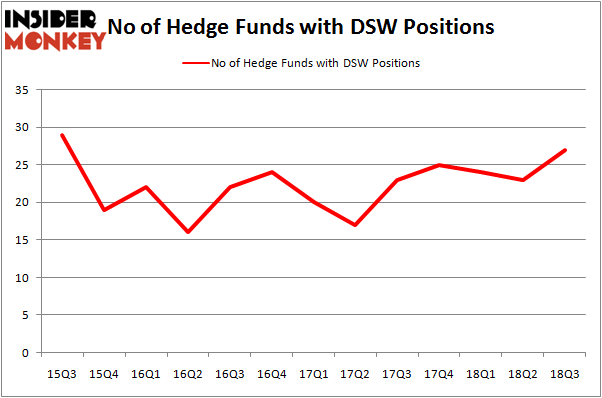 There were 23 hedge funds in our database with DSW positions at the end of the previous quarter. If you’d ask most market participants, hedge funds are seen as unimportant, old investment vehicles of the past. While there are greater than 8,000 funds with their doors open at present, We choose to focus on the elite of this group, around 700 funds. 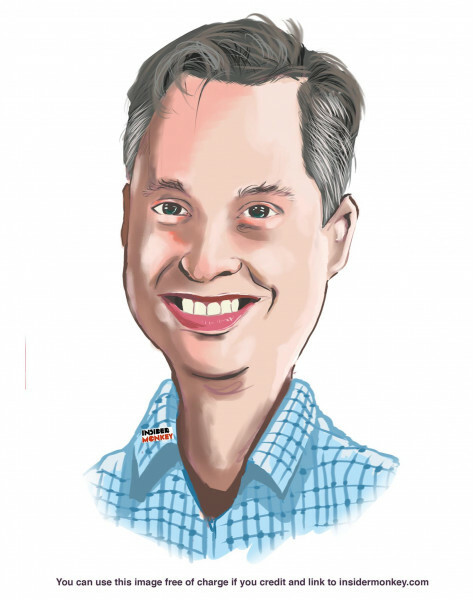 These money managers orchestrate the majority of the hedge fund industry’s total asset base, and by watching their inimitable equity investments, Insider Monkey has figured out many investment strategies that have historically surpassed the market. Insider Monkey’s flagship hedge fund strategy exceeded the S&P 500 index by 6 percentage points per annum since its inception in May 2014 through early November 2018. We were able to generate large returns even by identifying short candidates. Our portfolio of short stocks lost 24% since February 2017 (through December 3rd) even though the market was up nearly 23% during the same period. We just shared a list of 11 short targets in our latest quarterly update. Let’s take a look at the latest hedge fund action surrounding DSW Inc. (NYSE:DSW). What have hedge funds been doing with DSW Inc. (NYSE:DSW)? At the end of the third quarter, a total of 27 of the hedge funds tracked by Insider Monkey were long this stock, a change of 17% from the previous quarter. By comparison, 25 hedge funds held shares or bullish call options in DSW heading into this year. With hedge funds’ sentiment swirling, there exists a few noteworthy hedge fund managers who were adding to their holdings substantially (or already accumulated large positions). More specifically, Two Sigma Advisors was the largest shareholder of DSW Inc. (NYSE:DSW), with a stake worth $39.7 million reported as of the end of September. Trailing Two Sigma Advisors was Royce & Associates, which amassed a stake valued at $38.1 million. Renaissance Technologies, Balyasny Asset Management, and GLG Partners were also very fond of the stock, giving the stock large weights in their portfolios. With a general bullishness amongst the heavyweights, key money managers were breaking ground themselves. Tudor Investment Corp, managed by Paul Tudor Jones, initiated the most outsized position in DSW Inc. (NYSE:DSW). Tudor Investment Corp had $2.8 million invested in the company at the end of the quarter. Richard Driehaus’s Driehaus Capital also made a $2.8 million investment in the stock during the quarter. The other funds with brand new DSW positions are D. E. Shaw’s D E Shaw, David Costen Haley’s HBK Investments, and Michael Platt and William Reeves’s BlueCrest Capital Mgmt..
Let’s now take a look at hedge fund activity in other stocks similar to DSW Inc. (NYSE:DSW). These stocks are First Interstate Bancsystem Inc (NASDAQ:FIBK), Oceaneering International, Inc. (NYSE:OII), Simmons First National Corporation (NASDAQ:SFNC), and Deluxe Corporation (NYSE:DLX). This group of stocks’ market valuations match DSW’s market valuation. As you can see these stocks had an average of 13.5 hedge funds with bullish positions and the average amount invested in these stocks was $101 million. That figure was $278 million in DSW’s case. Deluxe Corporation (NYSE:DLX) is the most popular stock in this table. On the other hand Simmons First National Corporation (NASDAQ:SFNC) is the least popular one with only 9 bullish hedge fund positions. Compared to these stocks DSW Inc. (NYSE:DSW) is more popular among hedge funds. Considering that hedge funds are fond of this stock in relation to its market cap peers, it may be a good idea to analyze it in detail and potentially include it in your portfolio.